Beautiful, recently built holiday home with shared set-up pool near the village of Piolenc (2 km). This splendid holiday home offers a private terrace and a private section of the spacious lawn You share the pool and the driveway of the fenced lot with the friendly owner. The holiday home is situated on a departmental road. You cannot see the road due to the natural stone fence. The villa is comfortably furnished with spacious quarters on the ground floor. 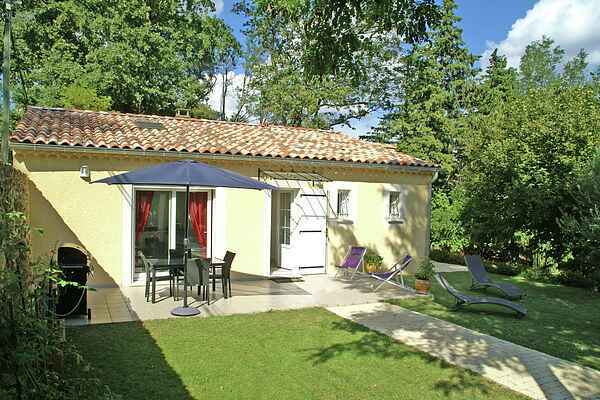 You are within an hour of the many tourist sights of the departements of Gard, Ardèche and the Drôme. We mention the amphitheatre of Orange (6 km), the medieval town of Vaison-la-Romaine (33 km) and the well known Gorges de l'Ardèche (ca. 30 km) with beaches and canoe rental. Piolenc lies in the departement the Vaucluse, which is best known for its charming wine villages such as Saint-Cécile-les-Vignes (17 km) that has a great market on Saturdays as well. If the children have had enough of touring villages, take them to the crocodile park in Pierrelatte (25 km) and to the park of Château du Cirque in Piolenc. Here they can see the preparations of the circus acts of the National Circus Alexis Gruss.